The goal of the Glenn County 4-H Proficiency program is to give members recognition and rewards in a timely manner and in a variety of ways to meet the diverse needs of today’s youth. To provide youth opportunities to sample a broad array of experiences, measure personal progress, and become self-directed learners. To provide a standard of excellence where members are recognized for knowledge and skills they have mastered. To provide guidelines for leaders to enhance and expand project content and experiences. 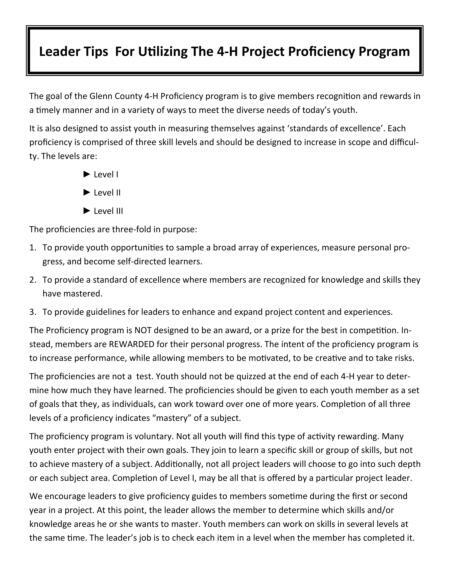 The Proficiency program is NOT designed to be an award, or a prize for the best in competition. Instead, members are REWARDED for their personal progress. The intent of the proficiency program is to increase performance, while allowing members to be motivated, to be creative and to take risks. The proficiencies are not a test. Youth should not be quizzed at the end of each 4-H year to determine how much they have learned. The proficiencies should be given to each youth member as a set of goals that they, as individuals, can work toward over one of more years. 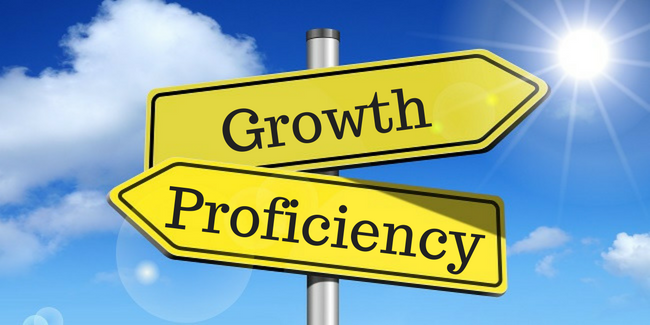 Completion of all three levels of a proficiency indicates “mastery” of a subject. The proficiency program is voluntary. Not all youth will find this type of activity rewarding. Many youth enter a project with their own goals. They join to learn a specific skill or group of skills, but not to achieve mastery of a subject. Additionally, not all project leaders will choose to go into such depth of each subject area. Completion of Level I, may be all that is offered by a particular project leader. We encourage leaders to give proficiency guides to members sometime during the first or second year in a project. At this point, the leader allows the member to determine which skills and/or knowledge areas he or she wants to master. Youth members can work on skills in several levels at the same time. The leader’s job is to check each item in a level when the member has completed it. For the skill areas which require demonstration, youth members may demonstrate individually to the leader (project or teen), the group, or the club at a local meeting. Members are not required to demonstrate in front of a group as we are measuring master of a subject, not public speaking ability. Some leaders leave time at the end of each project meeting for members to work on their proficiencies. term, use this time to teach the individual and allow member a month to think about it and review. The youth member will return with the knowledge learned and present it with confidence. Allow a significant amount of time (one month) to lapse between the time a skill is taught and member demonstrates mastery. This allows time to practice and achieve mastery, not merely reflect on a newly learned skill. Reward immediately! Recognition is most meaningful when it is presented immediately following a learning experience. Initial and date each item as the member completes the skill. 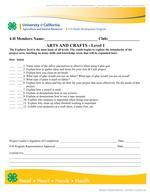 When all items in a level are completed sign the Certificate of Achievement and notify your County 4-H/UCCE Office. A Proficiency medal, will be sponsored by the Glenn County 4-H Council and awarded at the Star Awards BBQ when a skill level is completed. Youth may receive more than one medal per year. They may do this by completing two or more consecutive levels in one project area, or by completing one level in two or more projects. 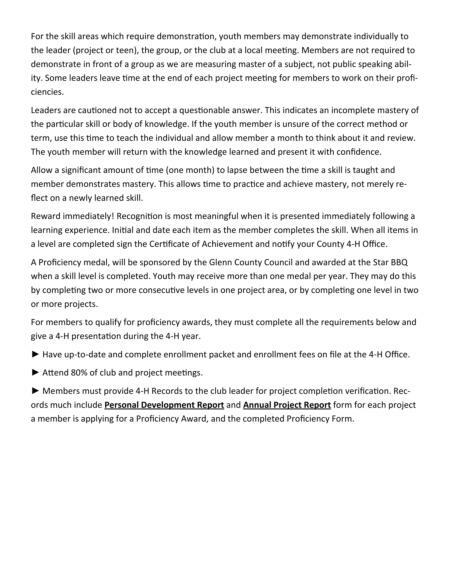 For members to qualify for proficiency awards, they must complete all the requirements below. 1. 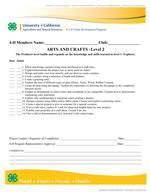 Have up-to-date and complete enrollment packet and enrollment fees on file at the UCCE Office. 2. Attend 6 out of the 8 club and project meetings. 3. 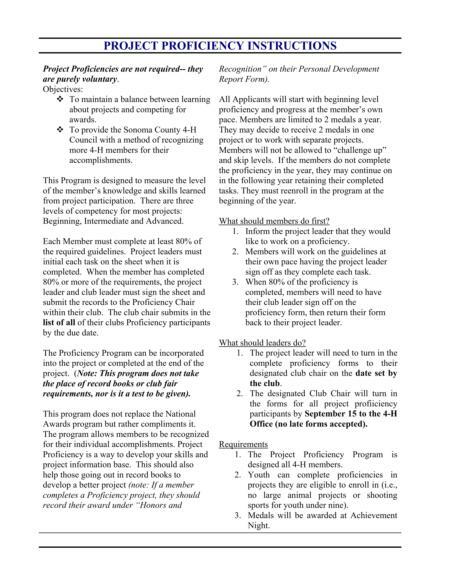 Members must provide 4-H Records to the club leader for project completion verification. Records must include Annual Project Report form for each project a member is applying for a Proficiency Award, and the completed Proficiency Form.